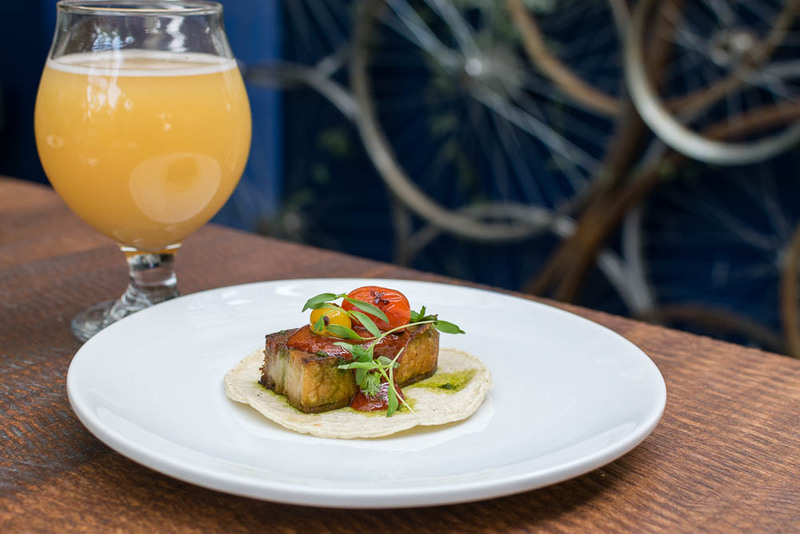 Downtown Tempe’s resident brewery, Pedal Haus kicked off their new collaborative series with a CRUlaboration with the highly-acclaimed Arcadia taqueria, CRUjiente Tacos during Cinco De Mayo weekend. Long-time restaurateur, Julian Wright and Brewery Director, Derek “Doc” Osborne worked hand-in-hand with Executive Chef Richard Hinojosa and Co-Owner, Jason Morris to create a one-of-a-kind seasonal brew along with a specialty dining experience for everyone to enjoy at the 14,000 square foot indoor-outdoor brewery on Mill Avenue. The restaurateurs debuted an exclusive culinary creation and beer in a “pop-up” setting at Pedal Haus Brewery. Chef Hinojosa will be taking over the kitchen for the day and serving up Roasted Pork Belly Tacos with Habanero Blood Orange Glaze in conjunction with the release of the “CRUlaboration” beer, a Blood Orange Gose-style beer. For people who were not able to make it to the event on Sunday, guests will be able to enjoy the same beer and taco combination on Monday, May 8 from 5 to 8 p.m. at CRUjiente Tacos in Arcadia and Julian Wright, founder, and Brewery Director, Derek “Doc” Osborne from Pedal Haus Brewery will be there from 5 to 7 p.m. Yesterday we attended a special media preview to try out this delicious pairing. Chef Richard Hinojosa never fails to impress! The Roasted Pork Belly Tacos with Habanero Blood Orange Glaze were fantastic. While we wished they were a bit spicier, the blood orange glaze was incredible and balanced the rich pork belly. The blood orange gose (pronounced “goes-uh” for those of you who are unfamiliar) was perfectly paired with the tacos. The blood orange notes really shone through. You can experience this wonderful pairing today for only $6.50 for beer and taco or $4 for the beer or taco only. You definitely don’t want to miss this CRUlaboration! Take our word for it! *The Geeks participated in a media event to facilitate this write-up; Information about the menu items was provided to us, opinions are wholly our own. View our Disclosure Policy for more info.